If there is anywhere for carbon dioxide to disappear in large quantities from the atmosphere, it is into the Earth's oceans. There, huge populations of plankton can soak up carbon dioxide from surface waters and gobble it up as a part of photosynthesis, generating energy for their livelihood. When plankton die, they sink thousands of feet, taking with them the carbon that was once in the atmosphere, and stashing it in the deep ocean. But now MIT climate scientists have found that the ocean's export efficiency, or the fraction of total plankton growth that is sinking to its depths, is decreasing, due mainly to rising global temperatures. "We figured the amount of carbon that is not sinking out as a result of global temperature change is similar to the total amount of carbon emissions that the United Kingdom pumps into the atmosphere each year," says first author B.B. Cael, a graduate student in MIT's Department of Earth, Atmospheric and Planetary Sciences (EAPS). "If carbon is just standing in the surface ocean, it's easier for it to end up back in the atmosphere." Cael's co-authors on the paper are Kelsey Bisson of the University of California at Santa Barbara and Mick Follows, an associate professor in EAPS. In 2016, the team first started looking into whether sea surface temperature has an effect on the ocean's export efficiency. 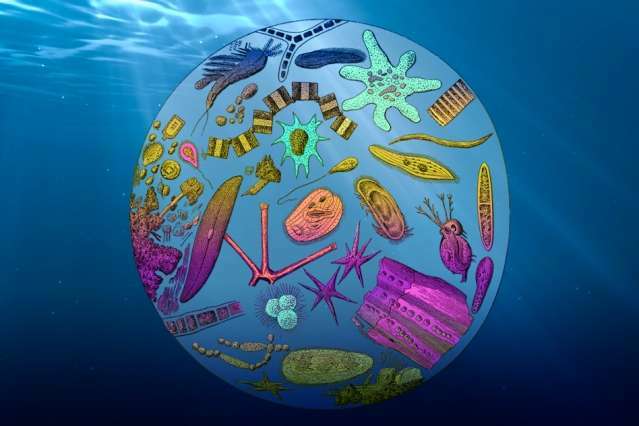 The group's main research focus is on marine microbes, including interactions between communities, and their effects on and responses to climate change. In 2016, the researchers developed a simple model to predict the ocean's rate of drawing down carbon at given sea surface temperatures. Their results matched with recorded observations of the amount of carbon exported to the deep ocean. "We had a simple way to describe how we think temperature influences export efficiency, based on this fundamental metabolic theory," Cael says. "Now, can we use that to see how export efficiency has changed over the time period where we have good temperature records? That's how we can estimate whether export efficiency is changing as a result of climate change." For this new paper, the researchers used the model to estimate the ocean's export efficiency over the last three decades. Since 1982, satellites, ships, and buoys have made measurements of sea surface temperatures around the world, which scientists have averaged for each measured location and aggregated into publicly available databases. "People probably expected a decline in export efficiency, but the thing I find interesting is, we have a nice way to try and quantify it," Cael says. "We're able to estimate that over last 30 years, export efficiency has declined by 1 or 2 percent, so 1 to 2 percent less of total plankton productivity is making it out of the surface ocean, which is actually a pretty big number." Cael says the team's model could potentially be applied to predict the ocean's future as a carbon sink, though uncertainty in temperature projections makes this a much more complicated goal. "How carbon moves around on Earth is fundamental to understanding both Earth's biosphere and climate, and requires understanding how carbon moves through the ocean," Cael says. "This [model] is something you could potentially apply to temperature projections, to guess how carbon will move through the Earth in the future." What was the increase of the world's oceans temps over the last 50 years? Why have the worlds oceans temperatures been going up and down in temperature "Naturally" for the last 800,000? How can you determine what is natural and man made heat trapping? Well, we know how much solar energy we receive and how it varies over time. We know what volcanoes explode and we know the impact that has on the climate. We know all sorts of non-human natural phenomena and how they would each contribute to the climate plus or minus. And we add them all together, and they predict a lower temperature than we actually observe. We know the physics of carbon dioxide and other gasses in the atmosphere, we know how much heat they trap, and we know how much of them are produced by human activity. When we add that factor in, we predict a temperature that more closely matches the observed temperature. Therefore, we know what fraction of climate is changing from human and non-human sources, and we find human sources to be driving the bulk of the change toward positive temperatures. Natural variations *do* occur in temperature, no one at all is saying they don't. They're simply saying that 1) when they change this rapidly it's usually a bad day for someone (extinction level events), and 2) when you add up the non human sources of warming/cooling, we would not expect this much warming this rapidly, so what is occurring is a distinctly human phenomenon. credible U.S. and other temperature data. It's even simpler than that, @shavera. All you need is a decent almanac to check rates of carbon fossil fuel consumption. It's not like it disappears anywhere. First law of ecology: nothing ever goes away.